This CD-ROM edition is a digitised version of a rich collection of photographs and drawings housed in the archive of the Krasnoiarsk Territorial Museum. These images were compiled in 1928 from glass-plate photographs and paintings done during the 1926-1927 Polar Census expedition. These high-quality images give us a unique insight into the lives of Evenki, Dolgan, Ket, Enets, and Nenets people at a time before the social policies of the Soviet state transformed their economies. The photographs and paintings also reveal the interests and scientific interests of the 13 young enumerators who took part of the expedition. Unlike most censuses, which in the end result in very dry lists of tabular data, this album gives us a very rich insight into the lives of people, and the enumerators who questioned them, at a very important date. The CD-ROM edition is intended to give the reader access to the images by census district and by the name of the enumerator. The disk is also structured such that the images can be viewed in the original more-or-less random order in which the album was composed. These two search parameters allow the reader to look at the images beside the primary written records of the census, which will also be published in a separate DVD edition. The 1926-1927 Polar Census was an ambitious undertaking of the young Soviet state. Its goal was to gain a deep overview of the cultures of the native peoples of Siberia. Conceived originally as part of the 1926 All-Russian Census, the this census provided extremely detailed records on all of the nomadic native peoples, many of whom at this time still lived independently from Soviet Power. In contrast to the general census, the polar census workers set themselves the goal the documentation of every aboriginal household. In addition, the Central Statistical Administration (TsSU) recruited experienced fieldworkers from the famous Committee of the North and from the Russian Society of the Red Cross to undertake the survey. Because of the energy and zeal of many of the younger members of the census, much of the primary records go well beyond what we understand today as statistics and represent a form of ethnography and social geographical analysis. Most enumerators kept field diaries, took photographs, and wrote detailed marginal notes on their census records that represent a form of ethnography. Indeed, many of the census enumerators later became professional ethnographers, geographers and biologists; building on their fieldwork to create an impressive bibliography of scientific literature. The quality and the scale of the material derived from this census, in international terms, outshines any other type of social, ethnographic, or geographic analysis done at this early date in any of the countries of the circumpolar Arctic. The primary field records of the polar census present a valuable insight into the lives of Siberian peoples, which is of value to circumpolar aboriginal peoples generally. Although the Polar Census was implemented at a level of great detail, its data were never used to their potential. By the time that the records were collated and analysed from 1929 to 1934 the mood of the Soviet state turned from one of exploring ethnic and cultural difference to identifying possible sources of counter-revolution. A series of articles in 1933 and 1934 criticised the Polar Census for not being sensitive enough to class analysis, and the primary materials were filed away to serve as background archives for territorial formation (zemleustroitelnye) expeditions and for ethnographers who knew of their existence. The published results of the census confined themselves to a demographic summary of the numbers of people living in Siberia as broken down by ethnicity, language, and ownership of key capital resources such as reindeer. The goal of this project is to collect, catalogue, and duplicate key parts of the Siberian Territory (Territory) Polar Census expedition, making them widely available to scholars. The project uses modern digital photographic techniques in archival work to create copies of the primary material of this branch of the census. This technology allows scholars, for the first time, to read documents pertaining to specific communities without having to travel to different cities across the Russian Federation. It also allows scholars to search the records along various standard criteria to discover which records are available for particular places, or particular peoples. The heart of this collection is a digital representation of a single photoalbum which was discovered recently in the document collection of the Krasnoiarsk Territorial Museum (KKKM 7930 á-ô 1) . The original photoalbum is an extremely large book (approx 70 cm x 40 cm) of black, firm paper onto which 12-15 photographs had been pasted on each side. The album has 25 pages, and is bound in a dark brown leather binding with the name Polar Census Expedition embossed prominently on the cover. The pages have become unbound from the album. The album features 513 small black and white prints, many of which are annotated with a short title and the initials of the person who took the photograph. This particular CD contains more images than the original photo album. During our research into the history of the expedition, our archive workers also discovered the original paintings and sketches by A.P. Lekarenko (as pictured in the photo album). We have chosen to include the entire collection of Lekarenko images, which includes 7 drawings not originally reproduced in the photo album. In addition, our research turned up a collection of glass-plate negatives linked to the collection. Fifty of these plates were identified as belonging to the expedition. Scanned versions from the negatives have been included in the collection. Our intention is to create a research tool which not only gives a digital representation of this unique album, but also provides a convenient source for all of the graphic work done during the Polar Census expedition. 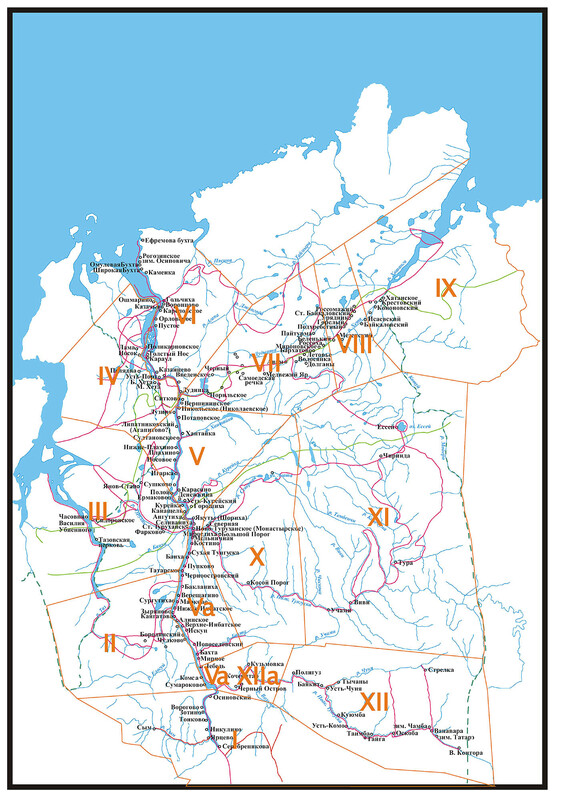 These districts were indicated with roman numerals. Their boundaries were determined by regional administrative officials who had experience with collecting Tsarist yasak from families in previous years when the yasak system was still in place. The geography of the census districts (ó÷àñòêè) has caused our team a lot of confusion, and it is important for readers to understand how it worked. At the beginning of the census expedition in the summer of 1926 the census districts were described according to essentially Tsarist yasak designations and on the basis of the work by Dobrovo-Yadretseva (1925). These tended to describe the habitual paths by which the state would expect to encounter native people. Over the year that the census was in progress, the entire territory was divided up into an early Soviet territorial administrative system wherein pre-existing guberniia were created into okrugy. Okrugy in turn were sub-divided into volosti. The organisation of the census material into the new system occurred in many cases after the fieldwork was over. As a result, one often finds older administrative-territorial designations written on the actual documents. For the census in Siberian Territory, the new 1927 system was indicated with a roman numeral marked on each card in a thick red marker. This roman numeral is different from roman numerals used to indicate the 1926 census districts. At the same time a new way of numbering communities was also applied. Thus our team has had to struggle with two different numbering systems in trying to discover how thousands of documents fit together. To make matters more difficult, some areas (such as the Podkamennaia Tunguska and Angara River Valleys) were not yet classified by Soviet influence by 1927 and were described only with the paradoxical name as the non-classified district (vnevolostnaia volost’). When trying to interpret these regional units in terms of the modern map of Krasnoiarsk territory and of Irkutsk Oblast’, it is important to remember that the external boundaries of these units have changed. The major differences between the map of 1928 and that of 2004 is that at the start of the Soviet period Tazovaskaia volost’ represents the present-day Turukhanskii raion of Krasnoiarsk Territory as well as substantial territories in what is now Tiumenskaia oblast’. It is also important to remember that the boundary between Krasnoiarsk okrug and what was to become the Rebublic of Sakha-Yakutiia had still not been determined. There are further summaries of how the census was organised in the publications of the census workers themselves (Kovalev 1928; Nagaev 1927; Kurilovich & Sirina 1999; SKSO 1928). On the main page of the CD-ROM, the reader can choose to search the collection either by the name of the registrar, or by one of the 15 census districts. The search page gives small, thumbnail images of the photograph with the archival classmark and other information that accompanied the photograph. Mikhail Batashev, through his research on the routes of the expedition members, was successful in adding other information which allows one to more exactly place the image. If one selects the image again on the search page, the reader can choose two further resolutions to create a larger, more detailed image. The photo album which forms the centre of this collection is one of four photo albums created from the field photographs of the enumerators (ÃÀÊÊ 1845-1-132; 769-1-480). The fate of the other three photo albums is not clear, nor is it clear if all of the albums were identical. References suggest that one album may have been sent to the Central Statistical Administation in Moscow, and that another may have been proved to the head-office of the Committee of the North in Novonikolaevsk (Novosibirsk). The Committee of the North paid for the cameras and materials for the census expedition. In 1929 a large museum exhibition on the peoples of Turukhansk Territory was organised in Moscow at what was then called the Museum of narodovednie. Records of the exhibition state that many photographs, as well as maps, models, and folkloric texts were displayed (ÃÀÊÊ 1845-1-132: 48). Whether or not these materials were returned to Krasnoiarsk is not known. Researchers should not omit the fact that the three Irkutsk-regions expeditions which were considered to be part of the census for Sibirskii Krai also returned with a wealth of photographs. These images were not included in this particular photo album, but it is possible that the photographs are stored in the Irkutsk Oblast Museum of Regional Lore (IOKM). The fact that the census administrators had invested so much energy in keeping a photographic record of Turukhansk region is in itself interesting. The census director, A.P. Kurilovich, exorted his enumerators to record as much material as possible about the lives of the indigenous people. His letters and instructions encouraged enumerators to record rituals, folklore, to make descriptions of the living environment of the native peoples. Aside from the collection of photographs and drawings, the census expedition left behind a rich record of diaries, and many qualitatively rich census forms which record details about the nature of life in the Turukhansk North. Part of the region for this interest in the lives of native peoples comes from a very deep regional tradition of gathering regional-lore (kraevedenie). In the years preceeding the census itself, many scholars were active in organising the documents which would be used in the census itself with the aim of gathering ethnographic information on the region (ÃÀÐÔ 3977-1-310; ÊÊÊÌ áô (èçîëàòîð) «ìàòåðèàë ê ïåðåïèñè»). If the reader looks at the photographs in the order that they are presented in the original album, he will gain a chaotic view of the material. The immediate impression created is one of an immense travel diary where images of landscapes overlap with personal photographs of the registrars themselves. Interspersed within the collection are numerous photographs of Ket, Evenki, Enets and Sakha people in what is now regarded as traditional costume, engaged in hunting, fishing, and household activities. As with the photographic collections of many ethnographers today, there are a high quantity of pictures of children and of reindeer. This particular CD collection allows the reader to look at the photographs as personal collections of each registrar. When one does so, interesting themes emerge. The future artist, A.P. Lekarenko, showed a great interest in textured landscapes, such as the imposing escarpments of the Putoran plateau. He also showed a fine interest in the details of costumes and ritual idols. The future ethnographer B.O. Dolgikh took pictures of people, often using the standard physical anthropological technique of photographing profiles. The future biologist N.P. Naumov has one of the largest collections which gives great intimate detail of the hunting and trapping lifestyle of people. In his collection one can examine the architecture of tents and stable dwellings, examine traps and tanning procedures, and see people engaged in their activities out on the land. Although the census records were never given the attention of state managers that they deserved, it would be a mistake to think that they have not been used in academic research. In the years immediately following the census expedition dozens of studies appeared in ethnography, economics, wildlife biology, public policy, and demography. Within ethnography, the key works were published by B.O. Dolgikh who wrote on local concepts of ethnicity in Taimyr (1929), Kets (1934), Nganasans (1938), authorised identities among Dolgans (1963). His classic work which on ethnicity in Siberia (1949) used census materials as their foundation. Within rural economics and social geography the enumerators Kopylov (1928) and Samokhin (1929) published fine community studies of the Kirinskii and Irkutskii okrugs and the Siberian census chief himself wrote a fine overview of Evenkiia (Kurilovich & Naumov 1934). Taresenkov (1930) used photographs and statistics to provide an overview of Turukhansk Territory. The first works describing Siberian reindeer husbandry also appeared at this time (Dobrova-Yadrinteva 1927a; 1927b; Tan-Bogoraz 1932; Karger 1930; Kerletskii 1931; Maslov 1934; Tereletskii 1930). N.P. Naumov, who later became a distinguished biologist, published is first works using observations he gathered during the census (Naumov 1928;1930;1934). In public policy, the census records were used initially to speak about the proper way to draw borders (Sushilin 1929; Berezovskii 1930a, 1930b), the tragic subject of the concentration of wealth (Skachko 1930a; 1930b; Suslov 1930). Finally in demography, the census records were used in debates on whether or not Siberian peoples were disappearing (Shneider & Dobrova-Yadrintesva 1928; Orlovskii 1932; Terletskii 1932; 1936). After the initial period, and following the time that the Polar census came under open criticism (Tan-Bogoraz 1932; Sergeev 1933) the number of works published using the materials fell dramatically. However, the primary records served and continue to serve as a rich source material for ethnographers. As mentioned above, B.O. Dolgikh continued incorporating the materials in his later publications. In 1952, the census records played a prominent role over a debate on ethnicity in the Olenok region of Yakutiia (Tereletskii 1951; Gurvich 1952). Recently, historians of ethnography have been recovering works on the census to write about the foundations of Soviet ethnography (Kuriliovich & Sirina 1999; Savolskul 2004). The primary materials of the census, however, have enjoyed little circulation internationally despite their quality which rivals that of other data collections on circumpolar peoples. In Canada and in Alaska, an entire discipline of ethnohistory has been founded upon the interpretation of trade and census records as applied to indigenous peoples. The records used by these ethnographers and historians tend to be fur-trade records, such as those left by the Hudson’s Bay Company, or state treaty records of specific Indian reservations (Biosli 1995; Krech 1991; Ray 1976; 1998). As a rule, indigenous people do not appear in state censuses until very late (the mid 1980s in Canada, for instance). The methods used to study these periods are rather like those used by Russian historians to study yasak registers. They tend to use crude multipliers to deduce population numbers from one sack of flour sold, or one marten skin traded. Nevertheless, these are the baseline studies used in English and French language studies to make large generalisations about society and economy in the Americas at the start of colonisation. The records of the Polar Census, by contrast, are much more comprehensive and much detailed. Their analysis could bring important comparative results in the field of ethnohistory. Not least of all this material will become increasingly important for indigenous peoples themselves as the revival of their national cultures continues and they conduct new political negotiations with the large forestry, gas, and diamond companies working on their territories. We hope that this digital collection will encourage an intense interest in the lives and cultures of the aboriginal peoples of the Yenisei North. Áåðåçîâñêèé À.È. 1930. Êàê ðàöèîíàëèçèðîâàòü ðûáíîå õîçÿéñòâî Òóðóõàíñêîãî êðàÿ. Ñîâåòñêèé ñåâåð ñáîðíèê ñòàòåé. ñ. 71-160. Áåðåçîâñêèé, À. 1930. Çåìëå-âîäî-óñòðîéñòâî Ñèáèðñêîãî Ñåâåðà. Ñîâåòñêèé Ñåâåð. No. 2: 50-73. Òàí-Áîãîðàç, Â.Ã. 1932. Ñåâåðíîå îëåíåâîäñòâî ïî äàííûì âñåñîþçíîé ïåðåïèñè. Ñîâåòñêàÿ ýòíîãðàôèÿ. No. 4: 26-62. Äîáðîâà-ßäðèíöåâà Ë.Í. 1925 . Òóçåìöû Òóðóõàíñêîãî êðàÿ. Îïûò èññëåäîâàíèÿ ýêîíîìè÷åñêîãî ïîëîæåíèÿ. Íîâîíèêîëàåâñê. Äîáðîâà-ßäðèíöåâà Ë.Í. 1927. Ê ìàòåðèàëàì ïî îëåíåâîäñòâó Ñèáèðñêîãî êðàÿ. Òðóäû Ñèáèðñêîãî Âåòåðàíñêîãî Èíñòèòóòà. tom 8 : 249-269. Äîáðîâà-ßäðèíöåâà. 1927. Îëåíåâîäñòâî â ýêîíîìèêå òóçåìíîãî õîçÿéñòâà ñèáèðñêèõ îêðàèí. Æèçíü Ñèáèðè. No. 5: 53-63. Äîëãèõ Á.Î. 1929. Íàñåëåíèå ïîëóîñòðîâà Òàéìûðà è ïðèëåãàþùåãî ê íåìó ðàéîíà. Ñåâåðíàÿ Àçèÿ. No. 2: 49-76. Äîëãèõ Á.Î. 1934 . Êåòû. Èðêóòñê. Äîëãèõ Á.Î. 1938 . Ëåãåíäû è ñêàçêè íãàíàñàíîâ. Êðàñíîÿðñê. Äîëãèõ, Á.Î. 1949. Ðîäîâîé è ïëåìåííîé ñîñòàâ íàðîäíîñòåé ñåâåðà ñðåäíåé Ñèáèðè. Êðàòêèå ñîîáùåíèÿ èíñòèòóòà ýòíîãðàôèè. No. 5 (1): 70-85. Äîëãèõ, Á.Î. 1963. Ïðîèñõîæäåíèå äîëãàí. Â Êí. Â. Î. Äîëãèõ (îòâ. ðåä.) (ðåä) Ñèáèðñêèé ýòíîãðàôè÷åñêèé ñáîðíèê 5. âûï. 84 , Tom. Òðóäû èíñòèòóòà ýòíîãðàôèè ÀÍ ÑÑÑÐ (íîâàÿ ñåðèÿ). ñ. 92-141. Ãóðâè÷, È. Ñ. 1952. Ïî ïîâîäó îïðåäåëåíèÿ ýòíè÷åñêîé ïðèíàäëåæíîñòè íàñåëåíèÿ áàññåéíîâ ðåê Îëåíåêà è Àíàáàðà. Ñîâåòñêàÿ Ýòíîãðàôèÿ. tom 2 : 73-85. Êàðãåð, Í.Ê. 1930. Îëåíåâîñòâî ó åíèöåéöåâ (êåòîâ). Ñîâåòñêèé Ñåâåð. No. 6: 28-38. Êåðëåöêèé, Ñ. 1931. Îëåíåâîäñòâî â ÑÑÑÐ è åãî ïåðñïåêòèâû. Ñîâåòñêàÿ Àçèÿ. Kn 1-2: îêîëî 27. Êîïûëîâ È. Ï. (ðåä) 1928. Òóíãóññêîå õîçÿéñòâî Ëåíî-Êèðèåíãñêîãî êðàÿ ïî äàííûì ñòàòèñòèêî-ýêîíîìè÷åñêîãî îáñëåäîâàíèÿ 1927 ãîäà. Êí. 58 Èññëåäîâàíèÿ êîëîíèçàöèîííûõ ôîíäîâ. Êîâàëåâ, Å.È. 1928. Ïðèïîëÿðíàÿ ïåðåïèñü 1926-27 ãã. â Ñèáèðñêîì Êðàå. Ñòàòèñòè÷åñêèé áþëëåòåíü (Íîâîñèáèðñê). No. 13-14: 214-226. Êóðèëîâè÷ À.Ï. ; Í.Ï. Íàóìîâ. 1934 . Ñîâåòñêàÿ Òóíãóñèÿ (Ýâåíêèéñêèé íàöèîíàëüíûé îêðóã Âîñòî÷íî-Ñèáèðñêîãî êðàÿ). Ìîñêâà, Ãîñ. èçä-âî ñòàíäàðòèçàöèè è ðàöèîíàëèçàöèè. Êóðèëîâè÷, À.Ï & À.À. Ñèðèíà. 1999. Îò÷åò Òóðóõàíñêîé ñòàòèñòè÷åñêîé ýêñïåäèöèè. Ýòíîãðàôè÷åñêîå Îáîçðåíèå. No. 5: 144-159. Ìàñëîâ, Ïàâåë. 1934. Êî÷åâûå îáüåäèíåíèÿ åäèíîëè÷íûõ õîçÿéñòâ â òóíäðå Ñåâåðíîãî Êðàÿ. Ñîâåòñêèé Ñåâåð. tom 5 : 27-34. Íàãàåâ. 1927. Ïðîèçâîäñòâî ïåðåïèñè â Òóðóõàíñêîì êðàå. Ñòàòèñòè÷åñêèé áþëëåòåíü (Íîâîñèáèðñê). No. 11-12: 207-209. Íàóìîâ, Í. 1928. Â Òóðóõàíñêîì êðàå. Çåìëåâåäåíèå. tom 39 vyp. 4 : 28-62. Íàóìîâ, Íèêîëàé Ïàâëîâè÷. 1930. Ïðîìûñëîâûå ìëåêîïèòàþùèå Òóðóõàíñêîãî Êðàÿ. Ñîâåòñêèé Ñåâåð. No. 3: 36-37. Íàóìîâ, Í.Ï. 1934. Îõîòõîçÿéñòâî Ñåâåðà âî âòîðîé ïÿòèëåòêå. Êðàéíèé Ñåâåð ê 1934 ã. Ñáîðíèê ìàòåðèàëîâ ïî õîçÿéñòâåííîìó è êóëüòóðíîìó ñòðîèòåëüñòâó. ñ. 68. Îðëîâñêèé, Ï. 1932. Òåððèòîðèÿ è íàñåëåíèå Êðàéíåãî Ñåâåðà. Ñîâåòñêèé Ñåâåð. tom 1-2 : 69-83. Ñàìîõèí, À.Ò. 1929. Òóíãóñû Áîäàéáèíñêîãî ðàéîíà. Ñèáèðñêàÿ æèâàÿ ñòàðèíà. vyp. 8-9 : 5-66. Ñàâîñêóë, Ñåðãåé Ñåðãååâè÷. 2004 . Íà÷àëî ïóòè: ó÷àñòèå Á.Î. Äîëãèõ â ïðèïîëÿðíîé ïåðåïèñè 1926-27 ãã. Sibirica vol. 3 (2): in press. Ñåðãååâ, Ì.À. 1933. Ê âîïðîñó î íàðîäíî-õîçÿéñòâåííîé ïåðåïèñè Êðàéíåãî Ñåâåðà. Ñîâåòñêàÿ Ýòíîãðàôèÿ. vyp. 3-4 : 9-28. Ñêà÷êî, Àíòîí. 1930. Èìóùåñòâåííûå ïîêàçàòåëè ñîöèàëüíûõ ãðóïï ó ìàëûõ íàðîäîâ Ñåâåðà. Ñîâåòñêèé Ñåâåð. No. 3: 5-28. Ñêà÷êî, Àíòîí. 1930. Êëàññîâîå ðàññëîåíèå, ìåðû áîðüáû ñ êóëà÷åñòâîì è êîëëåêòèâèçàöèÿ. Ñîâåòñêèé Ñåâåð. No. 2: 38-49. Ñóøèëèí, Í. Â. 1929. Ê âîïðîñó î íîâîé ãðàíèöå ìåæäó ïðèàíãàðñêèì êðàåì êàíñêîãî îêðóãà è ðàéîíîì Ïîäêàìåííîé Òóíãóñêè. Ñîâåòñêàÿ àçèÿ. No. 3: 114-125. Ñóñëîâ, È.Ì. 1930. Ðàñ÷åò ìèíèìàëüíîãî êîëè÷åñòâà îëåíåé ïîòðåáíûõ äëÿ òóçåìåíûõ õîçÿéñòâ. Ñîâåòñêèé Ñåâåð. No. 3: 29-35. Òàðàñåíêîâ, Ã.Í. 1930 . Òóðóõàíñêèé Êðàé. Êðàñíîÿðñê, Òóðóõàíñêîãî ÐÈÊà. Òåðëåöêèé, Ï.Å. 1930. Îñíîâíûå ÷åðòû õîçÿéñòâà Ñåâåðà. Ñîâåòñêèé Ñåâåð. No. 9-12: 42-85. Òåðëåöêèé, Ï.Å. 1932. Íàðîäíî-õîçÿéñòâåííàÿ ïåðåïèñü Êðàéíåãî Ñåâåðà. Ñîâåòñêèé Ñåâåð. No. 6: 5-10. Òåðëåöêèé, Ï.Å. 1932. Íàñåëåíèå Êðàéíåãî Ñåâåðà (ïî äàííûì ïåðåïèñè íàñåëåíèÿ 1926-27 ãã.). âûï. 1-2 , Tom. Òðóäû Íàó÷íî-Èññëåäåâàòåëñêîãîé Àñîöèàöèè Èíñòèòóòà Íàðîäîâ Ñåâåðà. Òåðëåöêèé, Ï.Å. 1936. Ñîñòàâ íàñåëåíèÿ Êðàéíåãî Ñåâåðà. Ñîâåòñêàÿ Àðêòèêà. No. 11: 36-41. Òåðëåöêèé, Ï.Å. 1951. Åùå ðàç ê âîïðîñó îá ýòíè÷åñêîì ñîñòàâå íàñåëåíèÿ Ñåâåðî-Çàïàäíîé ÷àñòè ßêóòñêîé ÀÑÑÐ. Ñîâåòñêàÿ ýòíîãðàôèÿ. No. 1: 88-99. Öåíòðàëüíîå Ñòàòèñòè÷åñêîå Óïðàâëåíèå; Ñìóëåâè÷, Á. ß.;Ï. Å. Òåðëåöêèé, Ï.Å. 1929 . Ïîõîçÿéñòâåííàÿ ïåðåïèñü ïðèïîëÿðíîãî Ñåâåðà ÑÑÑÐ 1926/27 ãîäà. Òåððèòîðèàëüíûå è ãðóïïîâûå èòîãè ïîõîçÿéñòâåííîé ïåðåïèñè. Ìîñêâà, Ñòàòèçäàò Öñó ÑÑÑÐ. Øíåéäåð, À.Ï. ; Ë.Í. Äîáðîâà-ßäðèíöåâà. 1928 . Íàñåëåíèå Ñèáèðñêîãî Êðàÿ (Ðóññêèå è òóçåìöû). Íîâîñèáèðñê, Ñèáêðàéèçäàò. Anderson, Benedict. 1991. Imagined Communities: Reflections on the Origin and Spread of Nationalism [Revised Edition]. London: Verso. Appadurai, Arjun. 1993. Number in the Colonial Imagination. in Orientalism and the Post-Colonial Predicament. Breckenridge, C. and Veer, Peter van der, 314-354. Philedelphia: University of Pennsylvania Press. Biosli, T. 1995. The Birth of a Reservation: Making the Modern Individual amng thr Lakota. American Ethnologist 22, no. 1: 25-53. Forster, Peter. 1973. Empiricism and Imperialism: A Review of the New Left Critique of Social Anthropology. Anthropology and the Colonial Encounter. editor. Asad, Talal, 23-38. London: Ithaca Press. Hacking, Ian. 1990. The taming of chance. The taming of chance. Ideas in context, 17. Cambridge: C.U.P. Hirsch, Francine. 2000. Toward an Empire of Nations: Border-making and the Formation of Soviet National Identities. Russian Review 59: 201-26. Krech, Shepard III. 1991. The State of Ethnohistory. Annual Review of Anthropology 20: 345-75. Li, Tania Murray. 2000. Articulating Indigenous Identity in Indonesia: Resource Politics and the Tribal slot. Comparative Study of society and History 42, no. 1: 149-179. Ray, Arthur J. 1976. The HBC Account Books as Sources for Comparative Economic Analysis of the Fur Trade: An Examination of Exchange Rate Data. Western Canadian Journal of Anthropology 6: 30-51. Ray, Arthur J. 1998. Indians in the fur trade: their role as trappers, hunters, and middlemen in the lands southwest of Hudson Bay, 1660-1870. Indians in the fur trade: their role as trappers, hunters, and middlemen in the lands southwest of Hudson Bay, 1660-1870. Toronto: University of Toronto Press . xxxiv, 249 p.